Nifty opened weak around 5855 but saw the buyer coming back and moved the index way beyond 5900 to the highs of the day at 5938. The seller got active at the highs and the index went into consolidation mode and closed flat at 5892.45, a smallish gain of 2.70 points. The broader though was negative, with 590 advances to 691 declines. The Option Table range till expiry comes around 5800-6000 with 5900 acting as Pivot. Call option 6000-6100 added 10.31 lacs huge amount of OI with profit booking seen at 6200 and above strike price. 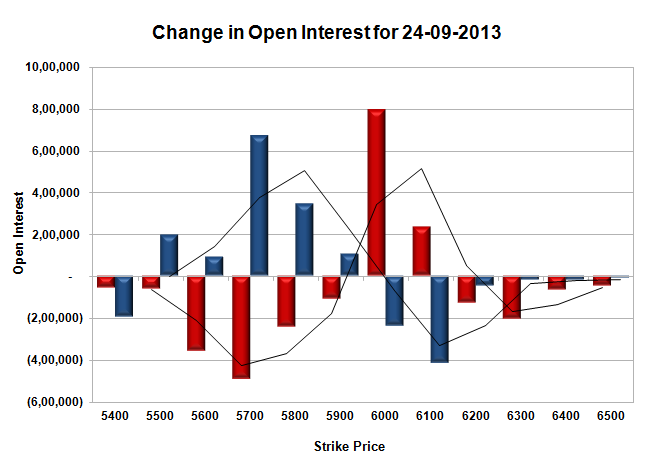 Put option 5900-5500 added 14.07 lacs huge amount of OI with short covering seen at 6000 and above strike prices. Nifty Open Interest is at 1,36,70,350 down by 10,41,550, whereas October series added 33.83 lacs, with not much change in price, most probably 100% rollover with huge long build-up. Bank Nifty Open Interest is at 13,61,600 down by 2,29,775, whereas October series added 5.06 lacs, with small decrease in price, most probably 100% rollover with huge short build-up. FII’s bought huge 13.87 lacs Futures, mostly long build-up, as their net OI increased by 62753 contracts (includes 210894 longs and 183145 shorts) and the average price per contract comes to around 5826.87. FII’s future open contract as on date is 663899. 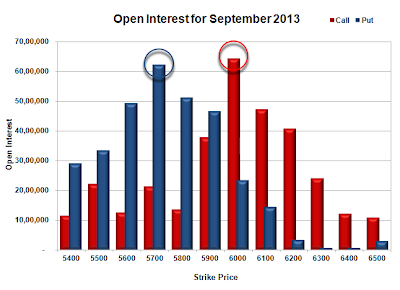 PCR Open Interest (Volume) is back again above 1.5 after the dip of yesterday and now at 1.541. 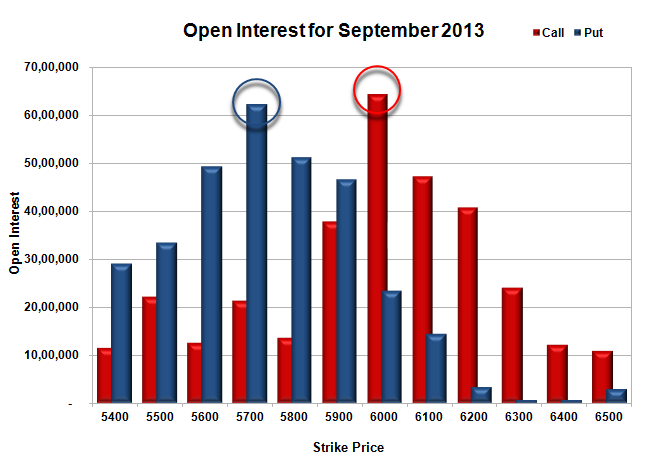 Support at 5800, with OI of 51.28 lacs, below that at 5700, with huge OI of 62.37 lacs. 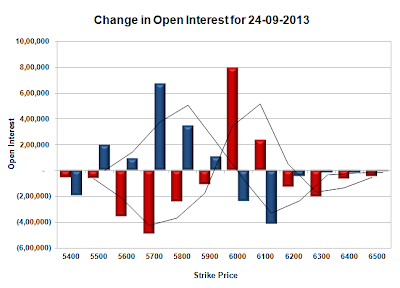 Super resistance at 6000, with highest OI of 64.32 lacs, above that at 6100 with OI of 47.16 lacs. 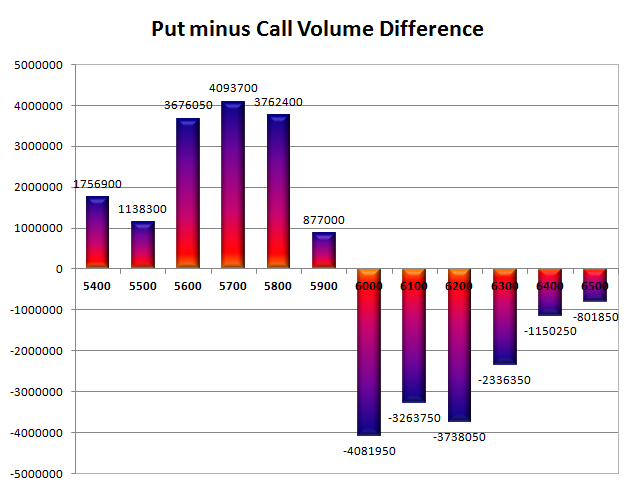 Day Range as per Option Table is 5796 - 5995 and as per VIX is 5810 - 5975 with 5895 as the Pivot.